The life of the world's first black professional footballer is being celebrated at the National Football Museum in Lancashire. 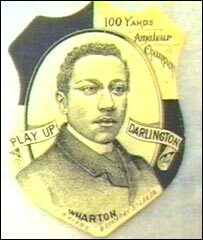 The exhibition detailing the life and career of Arthur Wharton is due to be opened on Tuesday by Viv Anderson - the first black player to be a full member of the England squad. Wharton was one of the leading goalkeepers of his time, in a career which spanned 16 years between 1886 and 1902. During that time he played for Preston North End, Stockport County, Sheffield United and Rotherham Town. Speaking ahead of the launch, at the Preston museum, Mr Anderson said: "It is an incredible story. "The accounts of the day say that Wharton should have played in goal for his country, but the administrators at the FA only selected white, English gentlemen to play for the national side." Wharton came to England from Africa's Gold Coast, now Ghana, but never played for his adopted homeland. Many contemporary newspaper reports testified to his skill between the sticks. But others used the racist language of the day, often comparing him to an animal in the way he moved between the posts. The museum's curator Mark Bushell said: "Many people think black players only began to play the game in this country in the 1960s and 70s. "Fans are genuinely amazed when they find out there was a black player in the late 1880s. "It's unbelievable that it took almost 100 years for a black player to break through at international level when, finally, Viv represented his country against Czechoslovakia in 1978."